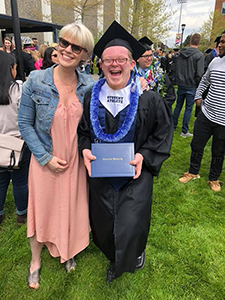 On Saturday, April 28th Cody Sullivan walked in the Spring Commencement ceremony at Concordia University and became the first college student with Down syndrome to complete four years at an Oregon university. He received a Certificate of Achievement in the College of Education and has already secured a job as a kindergarten teacher's assistant at Kairos PDX. In many instances, individuals like Cody are segregated from peers and typical instruction but Cody and his family worked hard to make sure he was included throughout his schooling, demonstrating how all students benefit from non-segregated classrooms and that adaptive, inclusive learning environments allow a diversity of learners to thrive. Through new programs at Portland State university, and organizations like Think College Inclusion Oregon Coalition, more secondary education opportunities are opening up to Oregonians for whom college was just a dream. However, there is still a long way to go. Many universities in the U.S. don't offer a modified or accommodating degree for those with intellectual disabilities. Think College Inclusion Oregon Coalition is a growing movement dedicated to creating college opportunities for students with ID in Oregon. 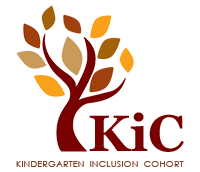 Learn more about TCIOC. Learn more about Think College national organization. If you'd like to make a donation to this work and be a part of the movement to break barriers to college, please click here.